The Cisco IP Phone 8851/61 Key Expansion Module extends the capabilities of Cisco IP Phone 8851, 8851NR, and 8861 models with additional buttons and a color LCD display. This key expansion module adds 14 physical keys with access to 14 additional keys, using the page keys, for a total of 28 additional keys. You can connect up to three 8851/61 Key Expansion Modules to the IP Phone 8861 and up to two 8851/61 KEMs to the IP Phone 8851 and 8851NR. The 3.5-inch graphical (TFT) color displays provides 16-bit color depth and 480 x 272 effective pixel resolution, with backlight. The display also supports localization requiring double-byte Unicode encoding for fonts. 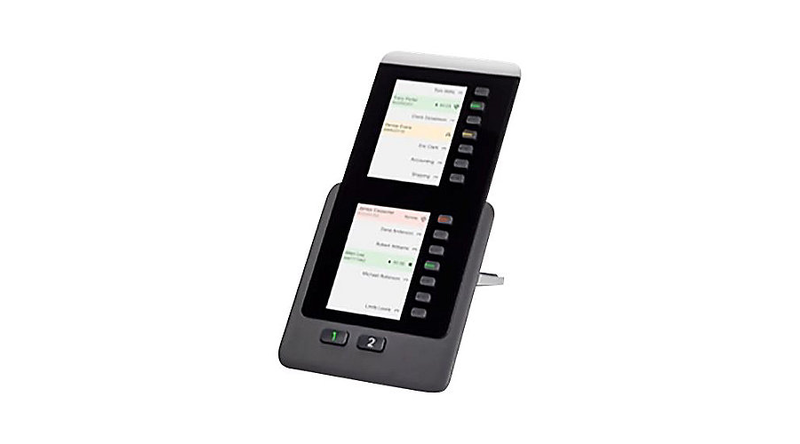 You can articulate the display to match the same angle as the Cisco IP Phone 8851, 8851NR, and 8861 that it is connected to. The module has 14 physical buttons (28 using page keys). Use the two page buttons to access each page of 14 buttons and provide phone status. When Cisco IP Phone 8851, 8851NR, and 8861 models are in power-saving sleep or inactivity mode, the Cisco IP Phone 8800 KEM is also in sleep or inactivity mode. Pressing any button on the key expansion module causes the display to awaken. The system administrator configures the inactivity period.